I made this photograph in the sand dunes of Wedge Island in Western Australia. The wind was blowing something fierce, and was making it very difficult to not only capture a shot, but to keep my eyes clear enough to see it! I found this beautiful s-curve leading in the direction of the setting sun. You can clearly see the sand blowing off its edge but also over the dunes themselves in the shadows. 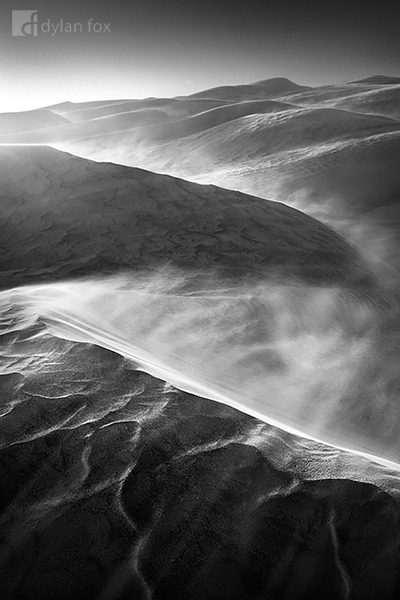 Shooting in sand dunes under these conditions is tricky, but is a lot of fun and the results can be stunning! Secure your limited edition, Wedge Island photographic print, 'Trail Blazing', by selecting your desired print size in the menu to the right.